Richard Canter's Scale and Rhythm Chunks books are "exactly what is wanted and needed" according to Dr. Tim Lautzenheiser. The books are designed so that students will be motivated to take home their books and learn new notes, rhythms, dynamics and articulations on their own in a simple and straight-forward way. Each "Chunk" exercise is short enough that directors can easily assess each student quickly and effectively. This affords students the opportunity to have frequent assessments to help them develop good habits for performance during the earlier stages of development. These books can be used from the 1st year of instruction through junior high. 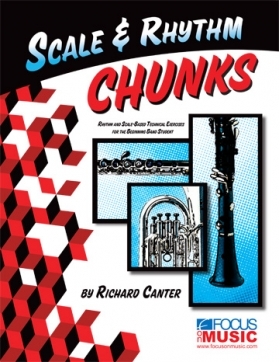 "Scale and Rhythm Chunks" can provide remedial help for learners who need more time to develop and provide extremely high goals for your advanced learners in need of a challenge. "Chunks" will make a huge impact on your program.